Towards the end of this month, the Spirit of Christmas fair in association with House & Garden magazine will be opening at Olympia in London. And I’m delighted to be giving away two pairs of tickets to the show which takes place from Tuesday, 30th October until Sunday, 4th November. If you’re looking for floristry inspiration or ideas on how to add floral fragrance to your home, the Spirit of Christmas fair is the perfect place to visit. 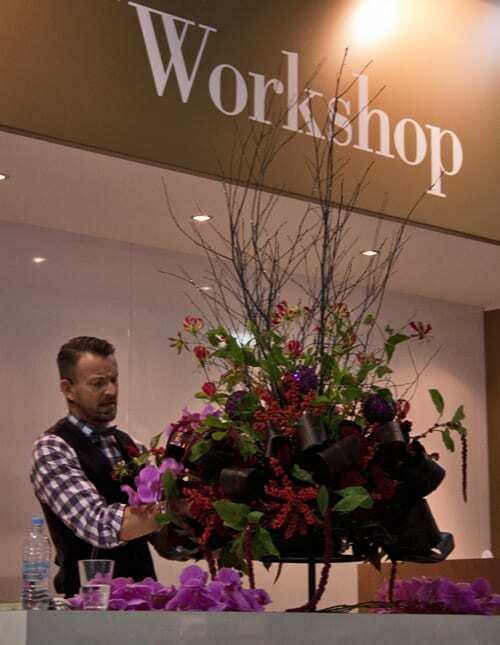 With clients that are synonymous with style, flair and profile, and amongst them are such luminaries as His Royal Highness The Prince of Wales, Her Majesty the Queen and Ringo Starr, florist Simon Lycett shares his festive floral ideas on October 30th & 31st and November 2nd at 11.30am. Combining exquisite floristry displays with an exceptional masterclass and projects under his belt including creating stunning floral creations as the Florist at The Dorchester catch florist Phillip Hammond on November 1st, 3rd & 4th at 11.30am. Join Debbie Wild, Lifestyle Director at Jo Malone London, in conversation with Julia Page, Editor at House & Garden, on how to celebrate Christmas in style. Discover evocative fragrances plus wonderful bath and body care to indulge someone you love. Sessions are on October 30th, 1st & 2nd November at 2.30pm. There will also be champagne masterclasses and cookery demonstrations, plus workshops on gift wrapping, decorating cupcakes and how to organise Christmas parties. To win a pair of tickets, all you need to do is simply leave a comment below telling me the name of your favourite flowering garden plant. The competition is for UK residents and one entry per household only. It’s open until midnight on Friday, 26th October 2012. I’ll put all the names in a hat and choose two winners, who’ll be notified by email on Saturday, 27th October 2012. Their tickets will be available on arrival at the fair in the Press Office. my favourite flowering garden plant are red Geraniums they remind me of Italy and sunny days. My favourite flowering plant is the poppy, the delicate simple flower symbolises the heady midsummer and its fleeting bloom makes you realise you should seize the warm sunny days with joyful enthusiasm. My favourite flowers are the hellebores: such an assortment of colours so early in the year when the garden is waking. The foliage is beautifully varied for use in hand ties throughout the year and the seed-heads last so long once placed in an arrangement. My favourite flower has to be the Lily. Such a beautiful flower with a perfume to fill the room. I love the cottage feel of frilly cyclamens and sweet little blue campanular’s. My walled garden is full of them that I’ve planted in September hoping there be fine for next year. I always love Lily of the Valley.Its such a beautiful small flower and smells delightful as well. My favourite garden flower has to be Lavender, fragrant and purple! Scabiosa is my favourite flower- tall and elegant! My favourite flowering plant is Rudbeckia. It’s a beautiful bright yellow with long elegant petals. Long flowering and a must for every garden. My favourite garden flower is the peony. I have always loved fuschia. I think it is probably the contrasting vivid colours, but they have always been my favourite. Good luck at the exhibition, hope it goes well. My favourite has to be Wisteria- it creates such a beautiful atmosphere in the early evening and looks so mysterious creeping up the side of an old stone wall. Has to be the Hydrangea, the dusky deep pinks and blues are stunning at this time of year. My favourite flowering plant is Jasmine, one sniff of its intoxicating perfume and I am transported to a Greek island on a balmy summer evening. Absolute heaven! I love sweet peas. Just close your eyes; take in the beautiful perfume and feel yourself wisked away into a wonderful cottage garden with every summer flower you can imagine. For me it has to be the delicasy of the snowdrop….braving the winters chill! My favourite plant is a pansy it reminds me of my grandad as it was his favourite plant when he was alive. My favourite are daffodils – they look so happy! My favs are Blue Salvias! Love all types of roses, they are beautiful in country cottages. Sunny Sunflowers – always make me thing of a warm summer’s day and a great holiday! I hope they count as a flowering plant! My favourites are gerberas- any colour make me smile! So happy to win these tickets, can’t wait to go. Thank you so much!! My favorite flower is the snow drop .So proud and sweet poking through snow.